The commonly agreed upon theory is that lionfish were first introduced into Atlantic waters in the 1990’s by aquarists dumping their exotic tanks into the ocean after hurricanes in Florida. (or maybe flushing ala Finding Nemo?!) and have subsequently spread up the East Coast and down into the Caribbean following the reefs of the Antilles chain. 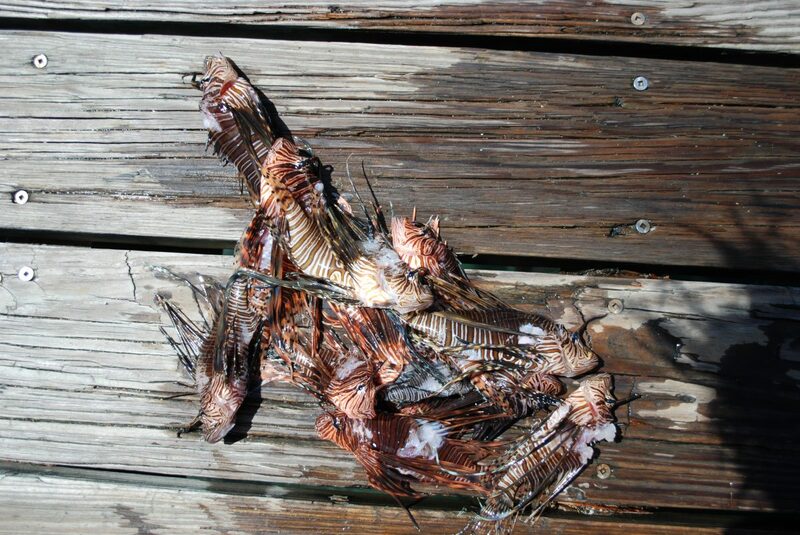 Genetic testing of lionfish in the Atlantic shows that this rapid spread could be the result of as few as THREE of the little buggers being released into Florida’s waters. According to Smithsonian Magazine “In 2000, a recreational diver saw two tropical lionfish clinging improbably to the submerged ruins of a tanker off the coast of North Carolina, nearly 140 feet below the surface. She alerted the National Oceanographic and Atmospheric Administration, which started tracking lionfish sightings in the Atlantic. Within two years, the fish had been seen in Georgia, Florida, Bermuda and the Bahamas. They are now known to live from Rhode Island to Belize.” Talk about Alien Invasion! So what’s the big deal? Well, I’ll tell you. They may be beautiful, but they are deadly to our reef ecosystems. Lionfish can grow up to a foot long and eat fish as large as 2/3 the size of their own body and their stomach’s can expand 30 times their normal size. They have voracious, non-discriminating appetites that include shrimp, parrotfish, juvenile groupers and other inhabitants of the coral reef system. They can lay up to 2 MILLION eggs per year that float on the surface and are carried swiftly by the ocean currents to new locations. In many areas of the Atlantic seaboard – including North Carolina – lionfish have become the predominant species on the reefs. Parrotfish are just one species that play a critical role in the reef environment eating algae and preventing it from smothering the coral polyps. This invasion has an obviously devastating effect not only on the reef ecosystems, but with a trickle down effect on local, commercial and sport fishing and other underwater tourism (snorkeling and Scuba diving). My weapon of choice is the pole spear with trident tip. Click to purchase! Not one to take this invasion sitting down, I decided to do my part, along with a group of dive buddies, and take a PADI Lionfish Eradication Specialty Course from St Croix Ultimate Blue Water Adventures here on St Croix. In fact, I was lucky enough to be taking the course by the guy who wrote it – Dive Instructor Simeon Tolar Yep, I’m now a card-carrying Lionfish Huntress! I opted to take a class, rather than just go out and start shooting for a couple of reasons. First, Lionfish are venomous and their spines pack a powerful punch. I wanted to be sure that I knew the proper way to handle them without getting hurt and I needed to know what to do in case I got speared by the spiny brats. Second, our coral reefs and the reef fishes are vulnerable enough to begin with. Without having proper instruction, I would run the risk of doing more damage than good. 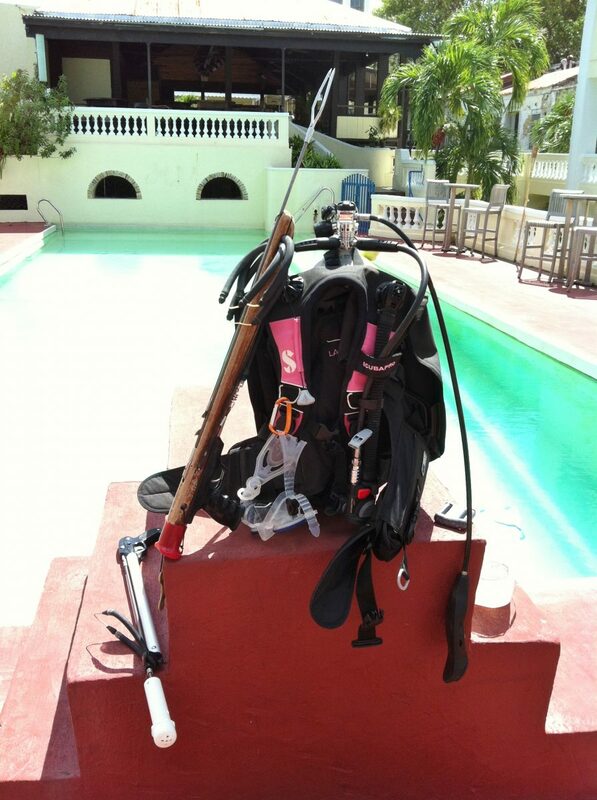 The St Croix SCUBA course was offered in one-day or taken in two sessions which was most convenient for our group. 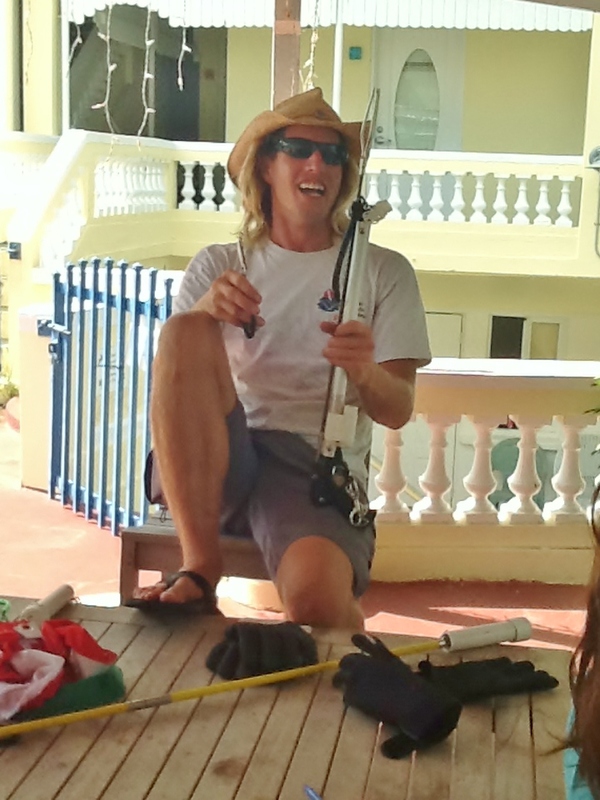 Our first session involved a brief lecture on the history of the invasion and the biological facts about lionfish – then we got into the pool with our gear on and practiced hitting targets with both spear guns and poles (I prefer the pole method). I’m so glad I got to practice in the calm of the pool. It gave me the relaxed environment I needed to get comfortable with the equipment and a non-moving target. For our next session, we headed out on the boat to a reef on the West End of St Croix that Simeon guaranteed would have plenty of live targets. And, scary but true, he didn’t disappoint us. We did two tanks on that one spot and the lionfish were plentiful. I think everyone in our group speared at least two. Not an easy task! While lionfish remain fairly still at first, they are sneaky and as soon as you take a shot – and miss – they jump and hide in deeper holes. Still, I got one and was wildly satisfied at being a new hunter, much to my surprise. 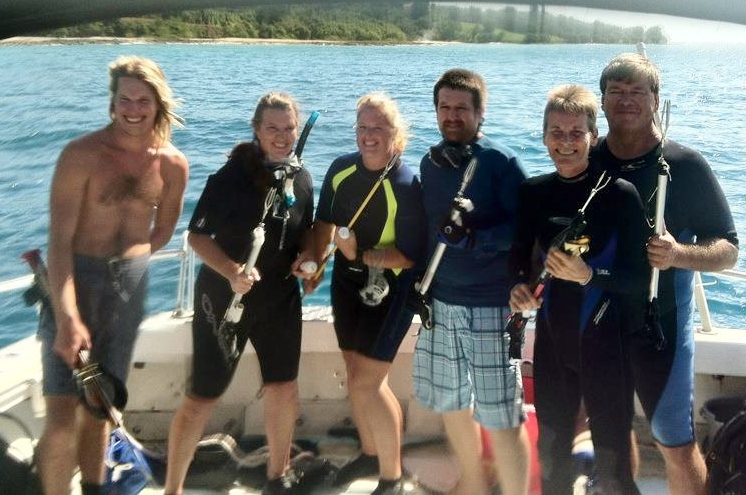 Lionfish can run, but they can’t hide from this group of Certified Hunters. Thanks Simeon and S.C.U.B.A. Park officials and Divers in Honduras are attempting to train reef sharks to prey on lionfish and it sure seems to be working. 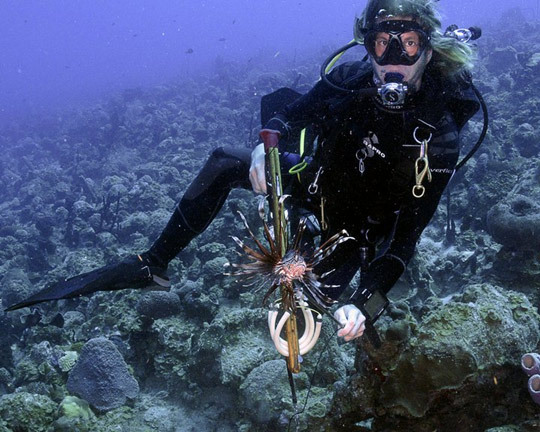 Here in the USVI and on St Croix Scuba divers are taking matters into their own hand with groups like The CORE Foundation The Caribbean Lionfish Response Program is unique proactive program designed to keep the invasion of the Indo-Pacific Lionfish from destroying our sea life, corals and reefs. The CLRP is collaborate effort comprised of Dive Shops donating boats at reduced rates, volunteer divers donating their time and money and Commercial Fishermen whose eyes and efforts throughout the waters of the Caribbean are invaluable. All these components are working together towards one common goal, keeping the Caribbean Lionfish Free.